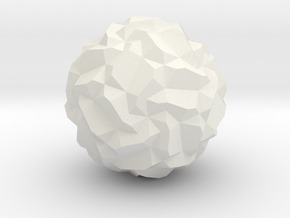 CURRENT STATUS EDIT 2: This model is available, but until someone orders it (I received interest), I can't provide a guarantee on the quality of the numbers. Good luck!EDIT: I received my order of two full-color d60s and the print quality with Full Color Sandstone is so poor that the numbers are illegible. Therefore, I am setting the colored dice to be unavailable for purchase, and they will remain that way until Shapeways introduces a higher-detail color material. 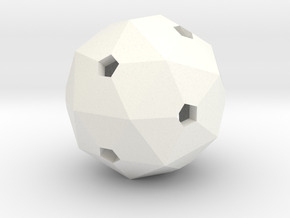 If you have already purchased one, I apologize for any dissatisfaction with the printing process, but there's nothing I can do.This 60-sided polyhedral die (d60) is based off a pentakis dodecahedron, meaning it will roll well as a die and produce fair results. 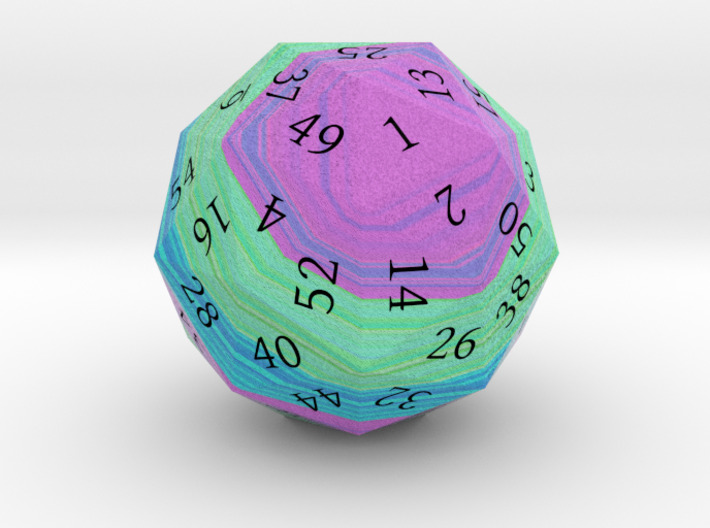 This die has a light striped texture running from the 1 to the 60 face, with an icy blue 60 and a purple 1. 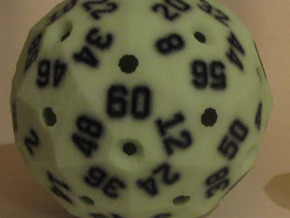 Because the die uses cool, somewhat-lightened colors, the solid black numbers should stand out and be easy to read. 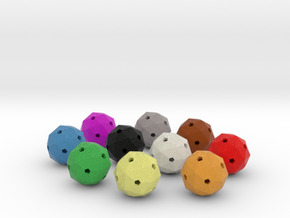 This is slightly larger than the original Red, Green, and Blue d60, so it will be slightly more expensive as well. This one is only available in Full Color Sandstone; see my other creations if you want the plain, non-colored die (one which will need to be inked by hand).